The works in Jonathan Meese’s third solo exhibition at Sies + Höke are unmistakably influenced by his investigation of Richard Wagner's opera Parsifal. A happy pairing: Wagner’s and Meese's works correlate congenially on different levels, both artists aim to create a total work of art (Gesamtkunstwerk) rather than individual artworks, the works are characterized by an explicitly expressive dramatic gesture, and both artists were and are imbued with the desire to transcend the social conditions of their time, by means of art. Parsifal enters the stage by committing a sacrilege: the killing of a swan. He destroys the symbol of peace and innocence, in the holy forest, where animals are sacred. The Knights of the Grail - the ruling system - are horrified. 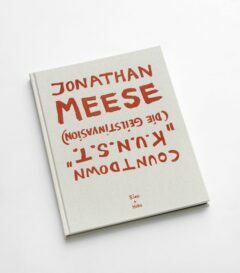 Likewise is Meese, as we know, in his performative approach a destroyer of icons. His intention like Parsifal’s is pure, unspoiled and aims to result in transcendence and the healing of existing conditions. Like Parsifal Meese matures by means of his reflection in the system, the response to his work, and the scandal – just as society matures through him. This Meese is accommodating: even at his most provocative he invariably looks for what unites rather than what differentiates. When looking at his work, this becomes evident in his self- or double portraits, where the artist and his subject melt into one. The theme of Parsifal’s yearning for the absent mother is also reflected in the exhibition, as well as the resulting study of origin, childhood and maturation. Therefore, the exhibition begins with early Meese-selfies, created long before the hype that began with smartphones, as well as with an expansive childlike wall drawing. Mainly out of focus, the photographs show the artist and at times his mother, too. Through endless repetition the self here is not constructed but broken down into fragile pieces. With development and maturation becoming a core motif, both regarding the artists’ own person, others and his own work, the Revolutionary inevitably takes a break in favor of the Evolutionary, and since this can happen only in a continuum, the work acquires a strong narrative component. Especially the works in the lower gallery make reference to the opera, as they convey something strongly reminiscent of theatre and their black backgrounds evoke the stage space in the Brechtian sense. In the upper gallery, the stage spreads throughout the room: in dramatic tension one is set against three, black and white against excessive color. Klingsor, the fallen knight, the personification of evil, against pure Meese-impact. But what is good, what is evil? A question that remains unanswered in the exhibition as well as in the opera. At the end greets Titurelmeeselfie. The cycle is complete. Curtain.